Posted on Mon, Jan 9, 2012 : 8:54 a.m.
Korean automaker Hyundai edged Ford and Volkswagen to win the North American Car of the Year award, which was revealed today at the Detroit auto show. 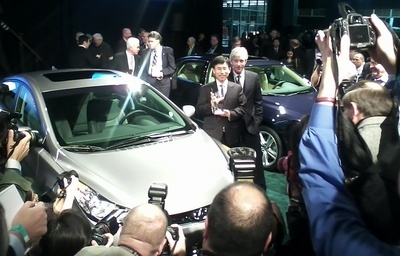 At the Detroit auto show, Hyundai executives accept the North American Car of the Year award for the redesigned Elantra. The Hyundai Elantra beat the Ford Focus and Volkswagen Passat to win the coveted award, which is distributed by a group of 50 independent journalists. In 2011, the Chevrolet Volt won the award. Hyundai’s Superior Township technical center, which employs about 170 people, conducted some calibration and testing work on the redesigned Elantra. The award, which the automakers wield as a marketing tool, reflected a surge in quality and respect for Hyundai, said Hyundai Motor America CEO John Krafcik. Since its redesign, the company has sold more than 200,000 Elantras, Krafcik said. The car is built at the company's manufacturing plant in Alabama. Also at the Detroit auto show today, the Land Rover Range Rover Evoque won the North American Truck of the Year award, defeating the BMW X3 and the Honda CR-V.
Tue, Jan 10, 2012 : 2:05 p.m.
Love my Hyundai! 10 years and the warranty expired. They even replaced a rusted fender! Mon, Jan 9, 2012 : 8:01 p.m.
Wow ! My Dad fought in Korea so that I would have the opportunity to buy one of these machines ! 'Way to go Ann Arbor ! You helped design my new 2012 Hyundai Elantra ! And I love it ! Mon, Jan 9, 2012 : 3:31 p.m.
Mon, Jan 9, 2012 : 2:20 p.m. I'm aware the car is widely considered to be very well done, but that warranty is not at all what Hyundai would have you believe. The &quot;fine print&quot; is that owners must strictly adhere to a ridiculously expensive factory maintenance program, with all kinds of &quot;routine&quot; maintenance at much-more-frequent-than-average intervals, or they will not honor the warranty, even on items not associated with whatever tiny maintenance procedure the owner might have delayed or missed. It's ridiculous. Tue, Jan 10, 2012 : 2:06 p.m.
Of course you have to maintain a car if you want it to last. I don't think prices at the local dealer are out of line at all. Service has been excellent at that dealer (for me at least). Guess you don't maintain your cars. Mon, Jan 9, 2012 : 2:03 p.m.
Good for Hyundai! They came on the American market with excellent, quality products that most Americans could afford, which include 10 year warranties. They deseve the the kudos and this award.